The Kansas Prosecutor is the official publication of the Kansas County and District Attorneys Association. It is a magazine dedicated to professional prosecutors across the state of Kansas for public information. If you have questions, comments, ideas for articles, or would like to submit an article for publication, please contact the editor, Brian Foster. 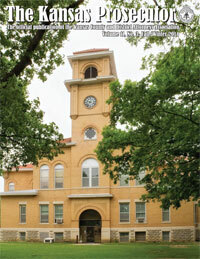 The Kansas Prosecutor magazine is available in a digital format in addition to the regular printed version. The digital format features a digital edition that looks just like a printed magazine and can be viewed on computers, tablets, and mobile devices with ease. Click on a date below to view archives of the magazine. Click here for magazine advertising information.